Are you a person with a special place in your heart for animals or a vegetarian or perhaps a vegan? Then this app is totally up your alley. Many of the products that we consume often conceal ingredients that derive from animals without us realising it. Did you know, for example, that chewing gum is not vegan? You will discover these handy titbits if you use this app. By scanning the barcodes, this app teaches you to make animal-friendly choices so that you can shop in a veggie-friendly manner and not be confronted with any unpleasant surprises. The app is easy to use. Whenever you have a doubt about a product or if, for example, you want to know in advance whether your product is animal-friendly, you can look up the product. The app has a list with all the products from which you can choose. Click on a product and you will see what it contains and whether it is free of animal-derived ingredients. 2. Veggi Rider – Are your children picky about food? Most parents are familiar with this: You can provide yourself with your daily need of fruits and vegetables, but your children don’t want any of that. This is a familiar story in most households. Fortunately, this is now easy to solve by downloading the Veggi Rider. This app is full of tips & tricks. Parents, experience experts, have already published two successful children books, but now have translated these into an app. This app is full of colourful and fantasy-rich recipes in order to make it also accessible to children. All the recipes have clear instructions so that they can all be easily prepared, even if you are not the greatest cook. In addition to the recipes, stories and lovely designs and photographs, Veggi Rider also offers a swift course in nutrition. This course is about topics, such as carbohydrates, calories, fibres, healthy weight, sugar and much more! It is easy to digest information with many tips about how you can improve your child’s diet. Healthy eating has never been so easy! 3. Left2Cook – Make each day a wonderful leftovers day! Does half of your food stock end up every week in the rubbish bin? This is of course pointless if you want to eat conscientiously. The new app lets you fight food waste… and with success. Lots of leftover food ends up in the refuse container. Do you always buy too much food and have an overstocked refrigerator? Left2Cook shows you how you can combine these ingredients. If your refrigerator is full, then don’t go shopping this time and instead install Left2Cook so that on that very same evening you will have a freshly prepared meal on the table! Left2Cook operates easily. You can use the app in two ways: you can enter all the ingredients that you have in your house or you can use it whenever you have no inspiration – for example, use it to prepare a delicious pizza. When entering the ingredients, don’t forget to tick oils and spices; the app can use these and you’ll be surprised by the many easy, fresh and delicious recipes that appear. If you get a green notification, then you have all the ingredients in the house and you can get to work immediately. An orange notification tells you that you’re missing an ingredient. If you are missing more than two ingredients, you get a red notification and then you will still need to go out shopping. In the second option, you tick an ingredient that you have in your refrigerator and all the related recipes appear. 4. Vegan Xpress – The search for vegan products and restaurants made easy! 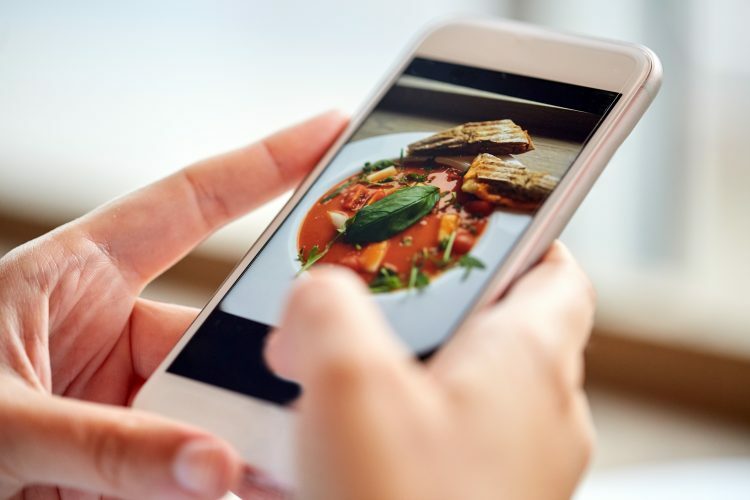 This app is certainly worthwhile if you want to grab a bite with your omnivorous friends. Vegan Xpress has done all the work for you in advance by creating an extensive list of vegan options. These options are suitable for a wide range of restaurants. The app has also taken into account the alcohol, sweets and snack department. The app not only gives you the vegan options in a restaurant, but it also processes food in the supermarket. Are you unsure whether a product is vegan? Vegan Xpress will figure it out for you. This app also operates very easily. As soon as you open the app, you come to the home page. Here you can select various sections. For example, you can select a wine or beer guide. Once you made a choice, you see a list of all the possible products. As soon as you choose one, you can see whether the product is vegan. Handy for a restaurant or on the road! Are you aware of all the E-numbers that are processed in your food? Did you know that many industrial orange juices contain E211, anadditive that aggravates asthma, can cause nettle rash and allergies, and is harmful for children? This is one of the many examples you get information about from the E Food Additives app. It is actually uncommon today to go shopping without the use of a reliable source that indicates which resources are harmful and which are not. Nowadays, there is so much industrially produced food. Knowledge of E-numbers does not mean that you suddenly eliminate all sorts of foodstuffs and drinks, but at least it helps you understand better what you consume. This app is also simple to use and very extensively built. The E-numbers are shown in sequential numerical order. You can also sort them according to name or hazardous substance. The E-numbers are marked by colour. Green means not dangerous, yellow shows that the E-number is potentially dangerous and orange means that the E-number is dangerous. If the E-number is coloured red, you better avoid the product. That way you know at a glance what you can buy and what you shouldn’t buy. In short, E Food Additives is an app that we should all have. If only to prevent paying for products that ultimately poison us.